What I want to talk about here, others say well and beautifully, so this post will invoke quotation for these two potent magics. And in anticipation of what’s to come, if you haven’t given yourself the wise pleasure of reading Ursula LeGuin’s fantasy A Wizard of Earthsea, promise yourself you will soon — your library may well have its own copy or can get you one through interlibrary loan — a “magical familiar” as powerful as any in the pages of medieval grimoires. A “young adult” fantasy, Wizard has as much to say about magical power as any book I know. If you haven’t read it, I’ve tried to avoid spoilers, and I feel I succeeded. And if you know of a book that teaches more than Wizard about these things, please send me the title! What actually attracted me to magic was not service but power. Nothing grandiose, of course. I had no burning ambition to rule the world or enslave hordes of beautiful women. (Well, maybe just one or two beautiful women…) But I was undoubtedly a prey to a disease which is becoming even more prevalent with the increasing complexity of modern society: a feeling of helplessness. There are many reactions to such a feeling. Some people embrace political credos. Others get religion. A few (usually male) take to beating their spouses. I turned to magic, which seemed to me to be the ultimate antidote: for what is magic if not a secret system which promises control of damn near everything? You will be desolate to learn it did not work. Although I spent some nine years in daily Qabalistic training and learned a great deal in the process, I remained Clark Kent: no amount of magical leaps into ritual phone boxes could turn me into Superman. In fact it’s a deeply legitimate response, tangled with helplessness. In so many peoples’ lives today — I’m thinking only of our own time — so much anger, pain, suffering, despair, all because we sense a deep truth about ourselves, but one that the world does much to discount, deny and distract us from: our spiritual selves are strong. LeGuin captures this wisdom at the outset, in the first chapter of A Wizard of Earthsea. Her mage hero Ged is still young, but even untrained, in a moment of crisis he draws on a profound truth about himself: “He … raged at his weakness, for he knew his strength” (A Wizard of Earthsea, Bantam Edition, 1975, p. 8). Our detestable weakness never quite overwhelms that inner knowing, though we may well go under without a lifeline, without support, without confirmation, without some practice that sustains us, whether it has the label “spirituality” or not. Despair at not being able to get at our strength has destroyed many lives. It’s cruel, that despair. In our search for a door to the power in us that we dimly recognize, but which seems to elude us day after wretched day, we may clutch at a cause, as Brennan notes — politics, or religion, or magic — or, if we’re half-under already, at abusive behaviors that may not target others in our lives, but ourselves, though all abuse brings “collateral damage.” Which is double-talk for karma. The appeal, the draw of power, is clear. The powers she serves are not the powers I serve. I do not know her will, but I know she does not will me well. Ged, listen to me now. Have you never thought how danger must surround power as shadow does light? This sorcery is not a game we play for pleasure or for praise. Think of this: that every word, every act of our Art is said and is done either for good, or for evil. Before you speak or do, you must know the price that is to pay! We seek power, yet once we commit to a magical or spiritual path, often the first thing we meet is darkness. In ourselves. Distinctly not fun. Ogion knelt down and built the fire on the hearth and lit it, for the house was cold. There it is in plain words — Ogion demonstrates literally the “Path of the Hearth Fire” that is one of the magical and occult paths we can take. And he does it not in words but in actions LeGuin describes — the daily tasks of an “ordinary life” that can be done with magical awareness of their place and purpose, a responsibility that we can serve while we learn — a way that actually leads to our ideal “inner Hogwarts” without fleeing from the obligations of our “mundane” world which have far more to teach us than we know. The problem with arrogance is that it is a quality for which I have a sneaking admiration. Consequently it plays a greater part in my character than it really should. 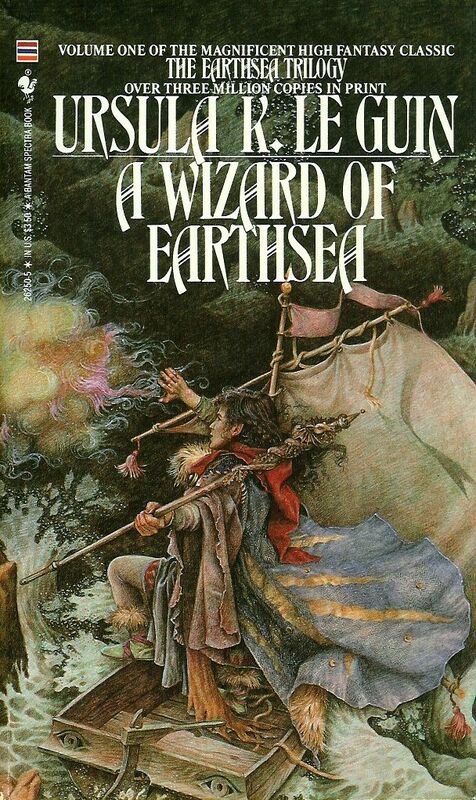 Images: A Wizard of Earthsea — cover. *translating Beowulf. In J R R Tolkien (ed. Christopher Tolkien). Beowulf: A Translation and Commentary. New York: Houghton Mifflin Harcourt, 2014, pg. 191. For much more on this that you probably could EVER want to know, come to the International Medieval Congress in Kalamazoo, MI this May 2015, where I and many others will be delivering papers on Tolkien’s translation — and in my case, on his peculiar theories of “correct style” and how this intersects with his whole legendarium and the power of imagination.